In fact, last week when President Obama proposed making more workers eligible for overtime pay, fat cats and CEO sycophants expressed abject horror that companies may have to pay employees more when they work more. President Obama estimated that 5 million workers would benefit from increasing the threshold. 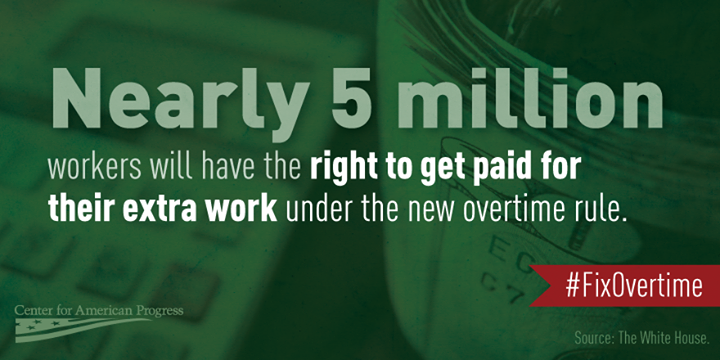 What that really means is that right now, corporations are cheating 5 million workers out of overtime pay they deserve because they labor more than 40 hours. These are salaried workers, so corporations can demand 50, 60, even 70 hours a week out of them for not a cent in additional compensation. Though inflation rose each year in the 40 since 1975, the threshold was raised only once in that time. That was in 2004, during the Bush administration, so of course it was a paltry increase. The threshold now stands at $23,660, moribund for 11 years. 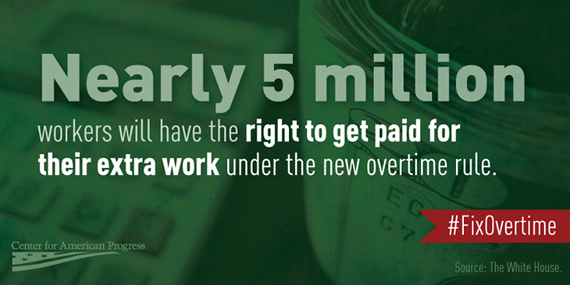 The result is that only 8 percent of full-time salaried workers qualify for overtime. Even under the proposed rule, not even half ­– 40 percent – would qualify. Still, highly profitable corporations are complaining. The National Retail Federation, the group that opposes all minimum wage increases, said “there’s no magic pot of money,” from which to pay overtime. There is, however, always a big fat magic pot load of money to pay CEOs. In 1965, CEOs at the nation’s 350 largest public firms made 20 times the pay of a typical worker employed by those companies. After the 1970s, however, worker pay stalled while CEO pay supersized. Since 1979, the compensation of the top 1 percentgrew 138 percent while the wages of the bottom 90 percent rose just 15 percent. Now those CEOs get 300 times the typical worker’s pay. CEOs at the top 350 companies in 2013 pulled down an average of $15.2 million a year, up 21.7 percent since 2010. CEOs have long argued that they are so great and so valuable and so special that they deserve to get in a day what a worker earns in a year. But a 2013 report by the Institute for Policy Studies smacks that down. The researchers found that nearly 40 percent of the highest paid CEOs over the past 20 years were eventually bailed out, booted or busted. That is, taxpayers came to the rescue of their companies, corporate boards fired the CEOs or investigators charged them. Even when CEOs mess up, they clean up. For example, when Hewlett-Packard fired Carly Fiorina as CEO, she walked away with a golden parachute worth $40 millionand left behind a corporation hobbled by an ill-advised merger and plunging stock value. There were no golden parachutes for the 30,000 workers she laid off. In 2013, corporate profits were at their highest level in 85 years. But workers whose labor created those bonanzas didn’t benefit. That same year, employee compensation was at its lowest level in 65 years. And it’s not getting any better. Average hourly earnings continued to remain flat in May. While the unemployment rate has steadily declined and the stock market climbed to new heights, corporations have failed to respond by raising wages for workers. They’ve also failed to reward productivity. For three decades after World War II, hourly compensation for the vast majority of workers grew at a rate very close to productivity growth. But from 1973 to 2013, pay for the typical worker rose just 9 percent while productivity increased 74 percent. Overtime explains part of that discrepancy. As an increasing number of salaried employees worked overtime and businesses paid them nothing at all for it, their productivity increased and corporations took all of the benefits from that. That’s exactly right. Businesses lavish CEOs with fat paychecks and perks whether they do a good job or not. A well-run firm could find money to properly compensate employees who devote extra hours to ensure the place keeps humming.